well, over the weekend, while visiting with ruth, i decided i just couldn’t stand that tulip – so i ripped it off. along with the bud. i will now make some changes to the drawing to enlarge the bud – make it more open, i guess. and then will try again with the new fabrics i found. i now have 4 reds instead of just the two. 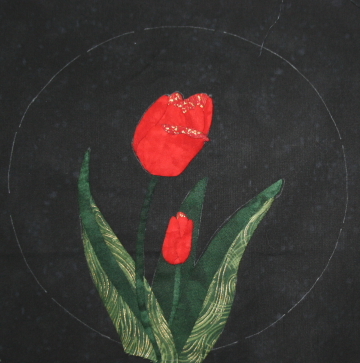 i am hoping that will give the tulip more depth and definition. while they are lovely to look at for real – they are tough to draw and have them be ‘interesting’. well, at least when you attempt to ‘paint’ them with fabric! wow, just looking around this page on which i’m writing. all new layout. not even sure how to add a photo now. hmmm perhaps i’ll try adding an old one – maybe even the now extinct tulip. ok, am leaving it where it turned up. can see i must practice a bit with the new system. could have sworn i chose “left” for orientation. that sure looks like “center” to me. ? ?